Alfred James Reach (May 25, 1840 – January 14, 1928) was an Anglo-American sportsman who, after becoming one of the early stars of baseball in the National Association, went on to become an influential executive, publisher, sporting goods manufacturer and spokesman for the sport. Born in London, Al Reach was a regular for the champion Eckford club of Brooklyn in the early 1860s before moving to the Philadelphia Athletics in 1865. When the National Association began, he helped them win the first professional baseball pennant in 1871. Upon his retirement from playing in 1875, he helped found the Philadelphia Phillies franchise. 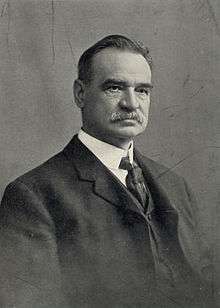 Reach served as team president from 1883 to 1899. Later, similar to Al Spalding, Reach formed a sporting goods company and earned millions. In fact, he sold his company to Spalding in 1889. Reach kept his interest in the Phillies franchise, selling out in 1899 to his longtime partner, John Rogers. Reach died at age 87 in Atlantic City, New Jersey, and is interred at West Laurel Hill Cemetery in Bala Cynwyd, Pennsylvania. 1 2 "Al Reach". Find a Grave. Retrieved September 3, 2010.